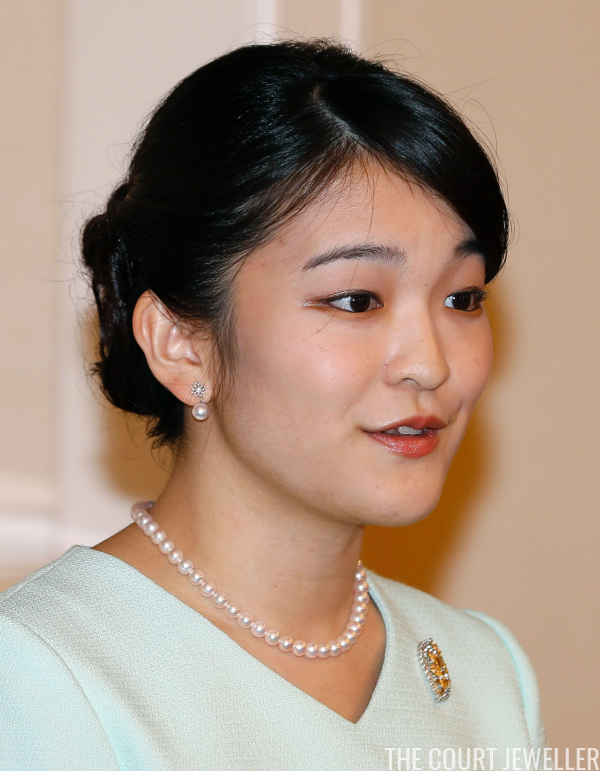 As anticipated, Princess Mako of Akishino, the eldest granddaughter of the Emperor and Empress of Japan, officially announced her engagement this weekend. Here's a look at the jewelry that she wore for the official press conference. 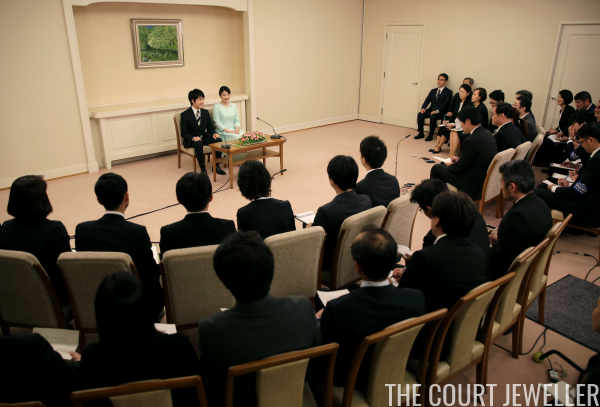 Mako sat beside her fiance, Kei Komuro, to answer questions from the press. Komuro works for a law firm in Tokyo, while Mako is a museum researcher. The couple met and began dating while in university. During the press conference, Mako revealed that she was "first attracted to his bright smiles that seemed like the sun," and Komuro added that he feels Mako "has been quietly watching over me like the moon" during their relationship. They have been unofficially engaged for almost four years. 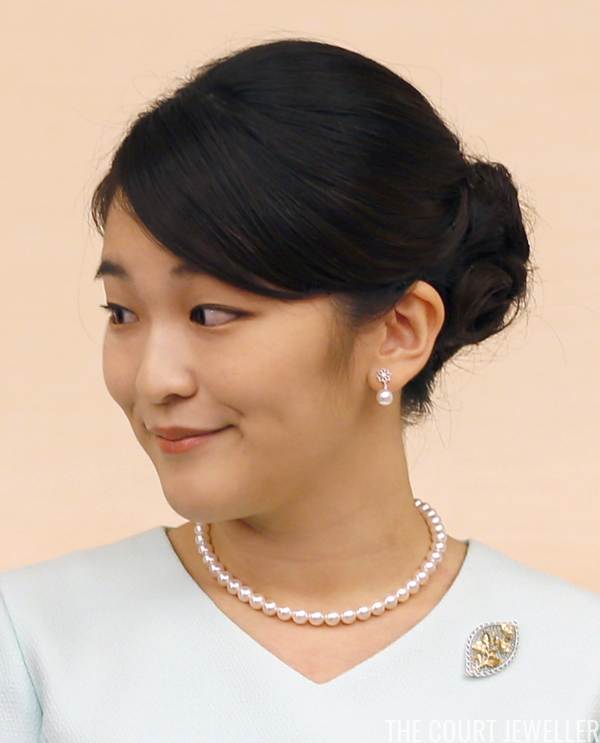 For the press conference, Mako didn't stray from the usual daytime jewelry uniform worn by ladies of the imperial household. She wore a single stranded pearl necklace with a small floral brooch made of mixed metals. Her earrings featured a silver-toned floral stud and a small round pearl drop. 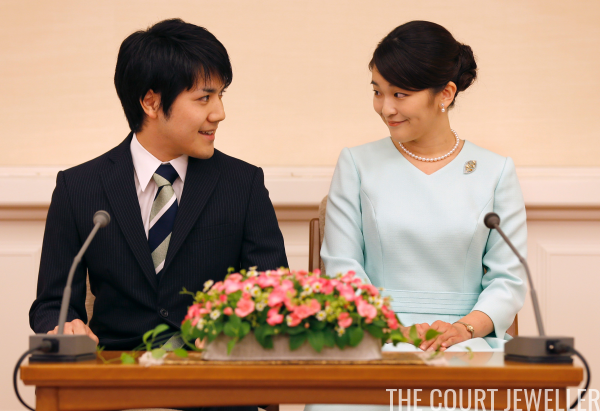 Mako's engagement has highlighted continuing issues with the dwindling succession of Japan's monarchy. Only paternal-line men can inherit the throne, and there are currently only four living heirs: Crown Prince Naruhito (Mako's uncle); his younger brother, Prince Fumihito (Mako's father); Prince Hisahito of Akishino (Mako's younger brother); and Prince Masahito (Mako's great-uncle). Japanese princesses who marry commoners (the only available choice they have currently in Japan) lose their imperial status and their public role. Mako will also leave behind her tiara, as we discussed this weekend. But she is clearly looking forward to the future today, noting that she "would like to have a family that is always calm and peaceful." The wedding is expected to take place some time after next spring.